An adjective clause (set of words) describes or modifies a noun. There are two types of adjective clauses classified depending on whether the clause is essential or not. Let us explore both the clauses in this grammar.com article. Restrictive clauses include information that are essential for the purpose of the sentence. Without these the sentence may not make sense or convey the intended meaning. That is, the clause restricts (makes specific) whatever it refers to. The clause follows who, which or that. · The pen which you have broken was mine. · The woman who came with us is my neighbour. · The petition that you filed 3 days back has been rejected. · The bike that we bought last year has been giving us different problems every day. · I did not like the movie that you recommended us to watch. As opposed to restrictive clause, non-restrictive clause is not critical to the sentence, but additional information without which the sentence would still be meaningful and convey the message of the sentence. Non-restrictive start and end with commas to indicate that the information within the commas is optional (non-essential). · Mr. James, who likes to eat popcorns, is a great football coach. · Our neighbours, whom we helped a lot, are moving out soon. · My favourite chocolate cake, which we ordered for my birthday, is unavailable today. · India was a rich country until 1608, when Britishers came and invaded. My sister, who was the college topper, hasn’t got a job yet. In the above sentence, the clause “who was the college topper” is not essential to identify the noun “my sister”, hence it is a non-restrictive clause. The girl who was the college topper hasn’t got a job yet. Notice the difference. Since we are talking about the ‘girl’, it could be anyone. So, the clause “who was the college topper” becomes essential to identify the noun (girl), hence it becomes a restrictive clause. A quick trick to differentiate restrictive from non-restrictive clause is to put the clause in brackets or omit it and then read the sentence. If the sentence still conveys the information that it is supposed to, then the clause in question is a non-restrictive one. "Restrictive vs. Non-restrictive adjective clauses." Grammar.com. STANDS4 LLC, 2019. Web. 22 Apr. 2019. 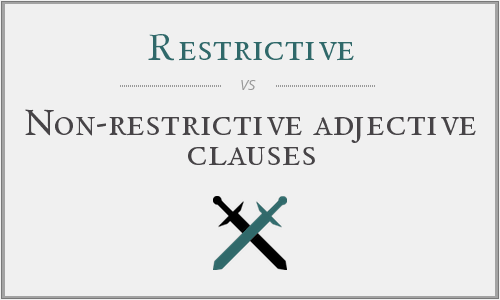 <https://www.grammar.com/restrictive_vs._non-restrictive_adjective_clauses>.